The Birmingham Guild of Handicraft was established in 1890 by local admirers of Ruskin and Morris, with Montague Fordham as one of the first directors. The Guild employed about 20 craftsmen and occupied a medieval building, Kyrle Hall, in Sheep Street, Birmingham. The pressure of work forced the Guild to expand and in 1895 it became a limited company. 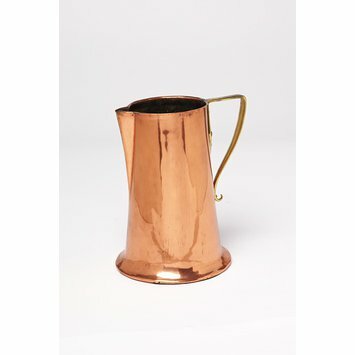 Arthur Dixon (1856-1929), the metalworker, was the chief designer for the Guild and design this copper and brass jug. In 1910, the Guild merged with the metalworking firm of E. & R. Gittins, who made fine jewellery as well as the architectural metalwork in which the Guild specialised. Copper with brass handle, stamped on the base B.G.H.